On the way to Tamegroute, where the driver kindly stopped so we could soak in this view. After taking a nice break in Essaouira, we headed into the deserts of eastern Morocco, where another project awaited us. Essaouira was so small that we could walk to the nearest intersection leading to the highway. We hitched a ride from a man delivering a coffee table in his compact car to Marrakesh. I squeezed in the back, my elbow resting on the table leg. He could only speak French, so we communicated in gibberish. At some point we were just listing random countries – at least it sounds similar in every language. We passed through Marrakesh, once again dodging accosting “guides” and rude taxi drivers. 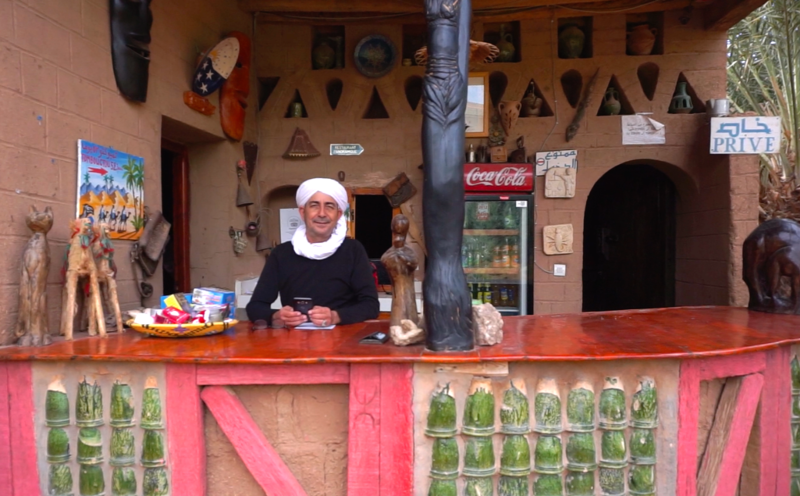 We hitched a ride to Oarzazate, a city just past the dense mountain range east of Marrakesh. Miraculously, the driver was an experienced tour guide and spoke perfect English, so we had our most conversational hitched ride yet. By complete coincidence, we learned that he knew the man organizing our next project, both having grown up and attended school in Zagora. The desert is not that big after all. 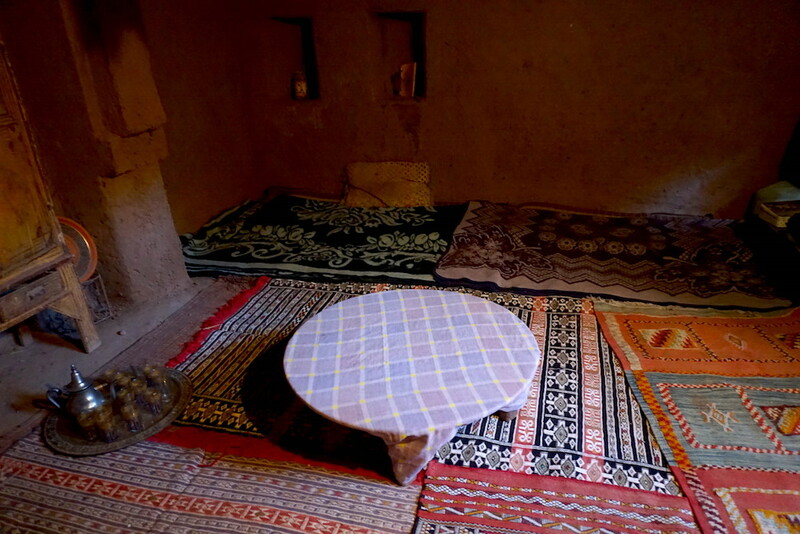 A typical “Berber” home in Tamegroute, deep inside thick clay walls to stay cool. It was 4 hours straight of winding, hairpin-turn roads, where I almost couldn’t keep down the 20-cent pastries I had that morning. When we arrived in Oarzazate, it was already quite late, so he recommended a hotel from which we even got a discount by mentioning his name (Hotel Baba, $13). It’s all about connections. In Oarzazate we went to a great local “snack” restaurant where Moroccan salads and fries were sold for 50 cents, delicious lentils for $1, with free bread and friendly waiter who spoke good English. Easily communicated and perfect dining experiences like these were a rare occurrence, and it sure brings a spring to your step. The following day we continued toward the desert, hitching one more ride in a friendly old man’s pick-up truck who kept stopping for me to take pictures, proud of his homeland. We made it to Tamegroute. The co-founder of Jnanedar Diafa, Saadiq, at the reception desk. 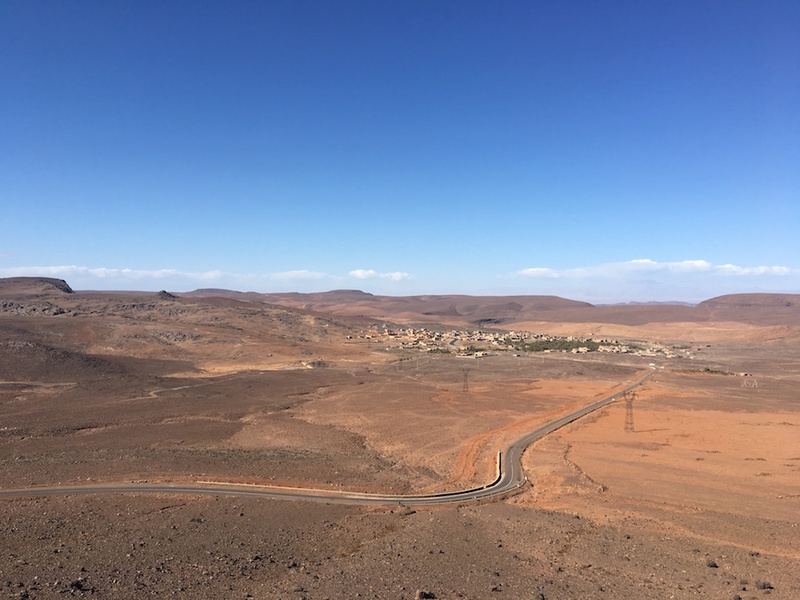 Just past the city of Zagora, where most tourists end their desert adventures, sits a quiet village with little to no foreigners. 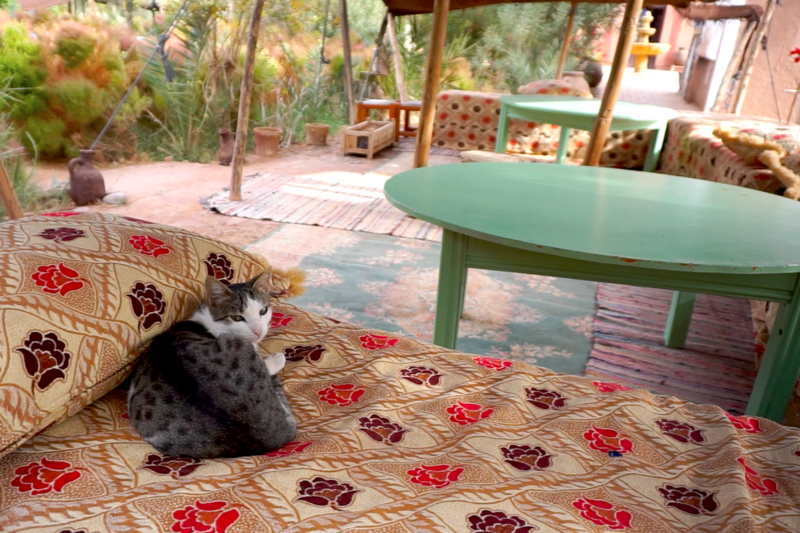 We arrived at Tamegroute to visit Jnandar Diafa, an Auberge (French for “low-key hotel”) full of greenery just on the edge of the clay desert town. It’s a large estate surrounded by tall clay walls built over 200 years ago. Rooms have since been built along these walls with the same method, keeping it warm in the winter and cool in the summer. Jnanedar was founded by a turban-sporting local man named Saadig and a retired German woman named Doris. Together they had started a business providing accommodations and desert camel tours, and had raised several camels on the site until it became too expensive to keep. Now it’s strictly a B&B and garden, with a resident chef who makes delicious tajines. One of the many cats who roam the estate doing what cats do best. Although it’s in the middle of the desert with temperatures up to 50°C during the summer, they are able to keep the space green and comfortable through old methods. The gardens are irrigated through a drop-by-drop system and punctured hose. They even used to have a functioning swimming pool, where the water would then be used for irrigation. Although the camels are gone and pool is dried out, the property is still home to a horse, cow, sheep, a family of rams, and countless stray cats that wander in from the neighborhood. Co-founder Doris is am adventurous woman with many stories to share, including tales of what happened to her beloved camels and how some were possibly poisoned. In our project are just a few of the great stories that Doris shared with us. The desert is no joke. Tamegroute was so dry my skin was literally cracking from the inside. Our whole time in Morocco, we only experienced rain once, which lasted less than 10 minutes. It was incredible to witness the kind of creations that can emerge despite such limited resources. This country’s ability to thrive with little to no precipitation is nothing short of miraculous. Even the United States continues to frequently struggle with either severe draught or devastating floods. As we drew closer to November, the nights started getting colder in the desert. Although we were warm within the thick century-old walls of the Jnanedar, we soon headed to depart Morocco. We hitched a ride with fellow guests to make our way to Fez, where the local vs. tourist disparity really struck.